Strong Families. Thriving Businesses. Healthy Communities. Family businesses are at the heart of the community, culture and the economy. Nearly 80 percent of the business in the United States are family-owned, employ over 60 percent of the population and consistently outperform publicly held companies. Yet few experience the training and support to transfer ownership successfully. 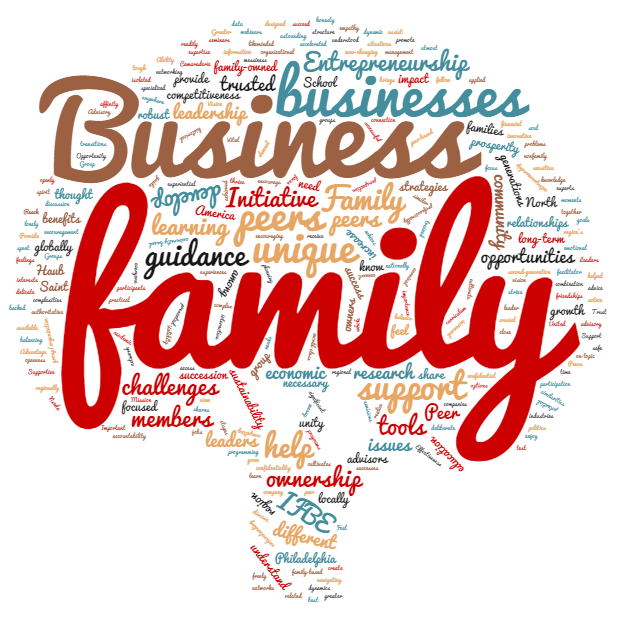 The Initiative for Family Business & Entrepreneurship brings together the dynamic regional family business and entrepreneurial community and cultivates learning opportunities and relationships that help families develop a robust network of peers, trusted advisors and tools to promote successful transitions. We are industry experts, educators, and family business advocates. We are a network of trainers, coaches, consultants, SJU faculty and peer advisors committed to helping family businesses stay relevant in a fast-paced, competitive marketplace. Most of our experts and staff come from family businesses themselves. We know how to help family businesses and entrepreneurs understand what it will take for their ventures to succeed now, and in future generations. Our membership community appeals to a broadly-defined family business audience — from first generation, single family member start-ups, to long-established, multiple generation enterprises — and our constantly evolving executive education programming covers a variety of relevant family business topics such as Family Conflict & Crises, Governance & Compliance, and Succession & Exit Strategy.